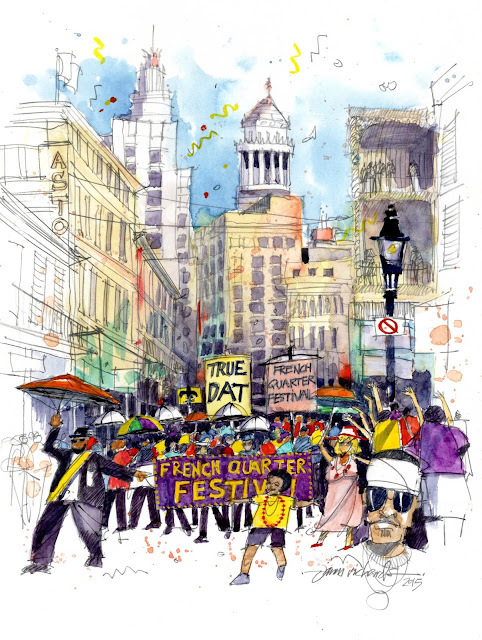 James Richards Sketchbook: Believe it or Not, It's Carnival Time!! Believe it or Not, It's Carnival Time!! Right on the heels of the holidays, New Orleans' carnival season officially opened January 6, kicking off an unusually short 5-week season culminating in Mardi Gras on February 9. Then, of course, the spring festival season begins, with favorites like French Quarter Festival (shown here), Voodoo Festival and Jazzfest keeping things hopping into early summer. This almost non-stop revelry brings back memories of growing up in and around the Big Easy, and the scores of festivals Patti and I attended there since. 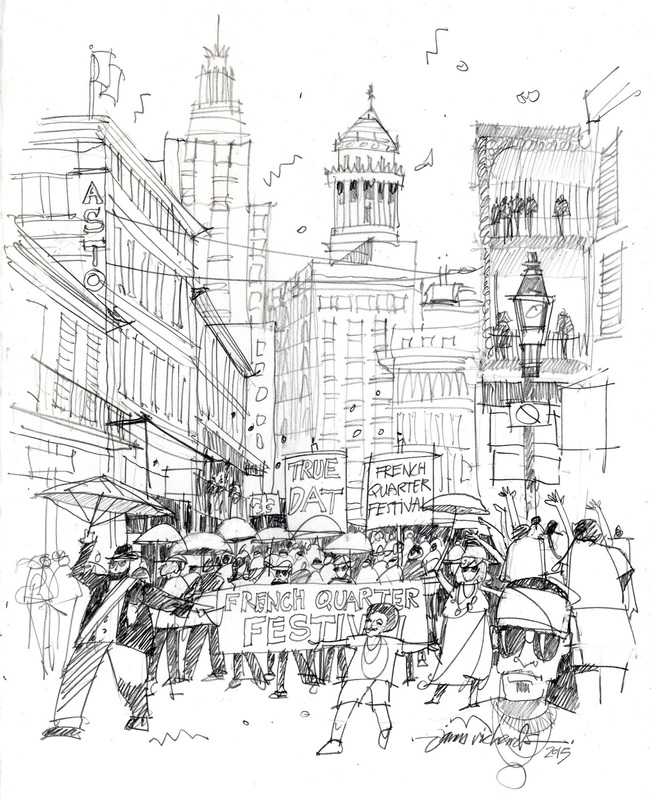 The pencil sketch below was drawn on-location at the kickoff of the French Quarter Festival Second Line Parade last spring. 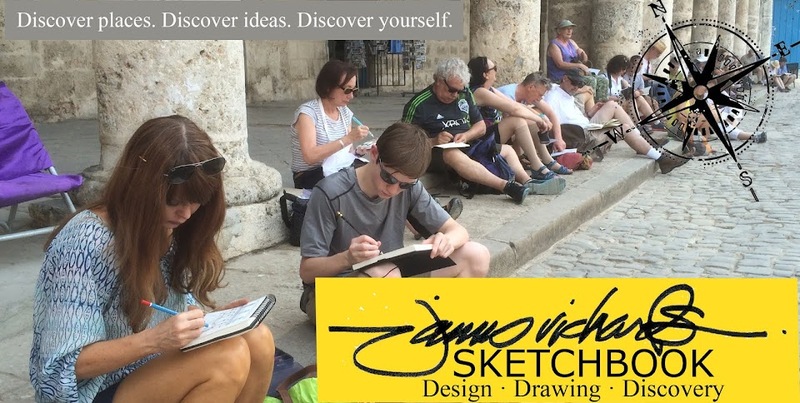 Taking a lesson from legendary artist-reporter Franklin McMahon, I arrived early, and sketched in the city context before the action started, leaving enough blank space in the middle of the scene to add the revelers when they arrived. As the parade approached, I quickly sketched a few quick figures and the placement of the signs. Then, as colorful characters strutted past (like the man with the sash far left), I simply drew them into the crowd. The sketch came together when I added darks in the foreground to separate people in the crowd and add some needed contrast. I did several pencil sketches that day, and added color was later in the studio. Enjoy your parades and festivals wherever you are! The French Quarter Festival Second Line Parade moving up Bourbon Street. Buildings drawn before parade arrived, then paraders sketched in quickly as they passed. Colors were added later, and tried to capture the festive spirit of the morning. I like your idea of getting there early to do the buildings first! This came out really great! It captures the energy of the crowd.